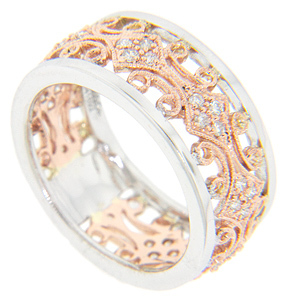 A filigree red gold center is adorned with quartets of faceted round diamonds on this 14K gold antique style wedding band. White gold edges frame the central pattern. The wedding ring measures 8.8mm in width. Size: 6 1/2. We can re-size.